Betty Carrington was born on Texas Downs station, which lies to the East of Warmun. However she grew up with her family at the old Turkey Creek Post Office and Police Station, an iconic community building now known as The Green House, occupied by Warmun Art Centre. Her father was a police tracker and her family lived there until the police station closed and her family moved back to Texas. 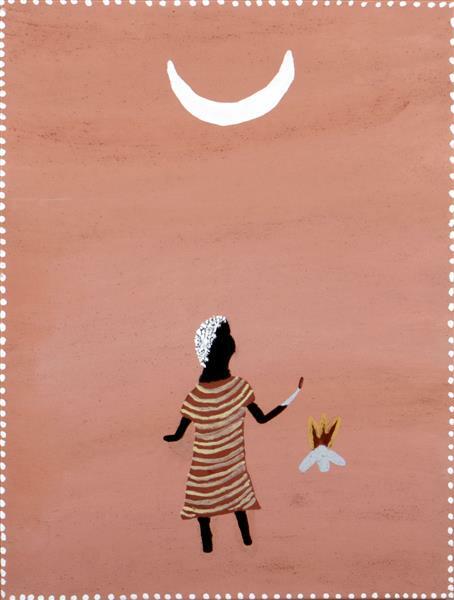 Betty’s work focuses on her country as well as strong and painful stories of historical events in the east Kimberley. 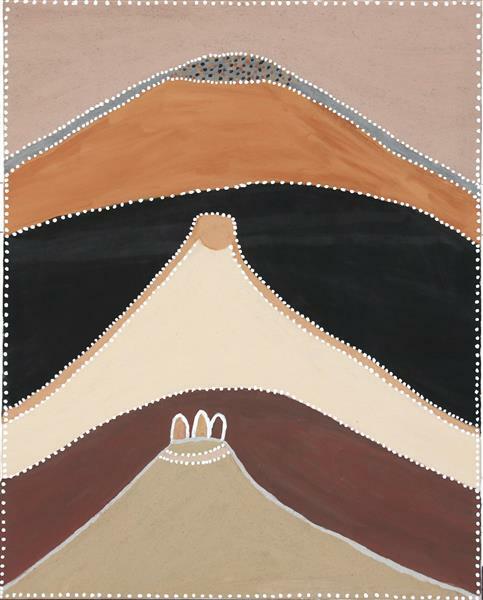 A recurring subject of Betty’s paintings are the hills of Darrajayin, her father’s traditional land southwest of Warmun. Betty also paints Ngarranggarni (Dreaming) sites and narratives from Ngarrgooroon, her mother’s country. Betty uses her painting to mark historical events such as the Mistake Creek massacre and the Warmun gymkhana where Aboriginal people working on Texas were first introduced to alcohol. A sensitive colourist, Betty’s mixing of natural ochre and pigments yields a rich palette of pinks, mauves, greens, blues and yellows. Betty began painting in 1998 when Warmun Art Centre was established. Her work has been hung in several solo exhibitions and with her partner Patrick Mung Mung at Gallery Gabrielle Pizzi, Short Street Gallery and Aboriginal and Pacific Art. She has also participated in numerous group exhibitions within Australia and overseas including True Stories: art of the East Kimberley at the Art Gallery of New South Wales. Several significant public and private institutions have acquired her work including the Museum and Art Gallery of the Northern Territory.